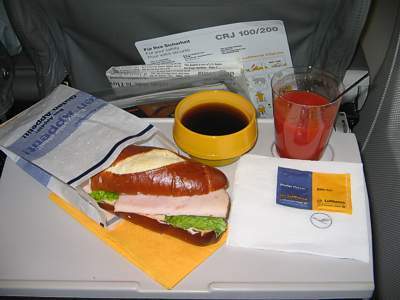 There is free food on all international Lufthansa flights, although from London this can vary from a bag of crisps to Frankfurt, a tiny roll to Cologne, or a larger roll to Berlin. 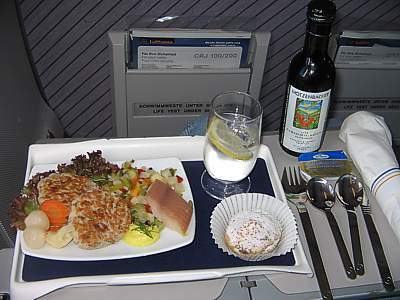 There is no food on domestic routes. 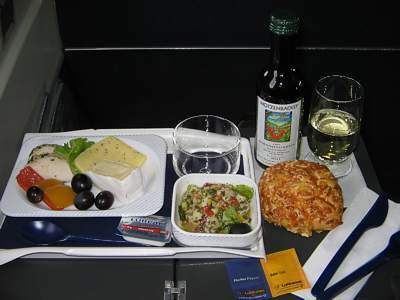 Metal forks and plastic knives are used on all flights, except to the US where the entire set is plastic. 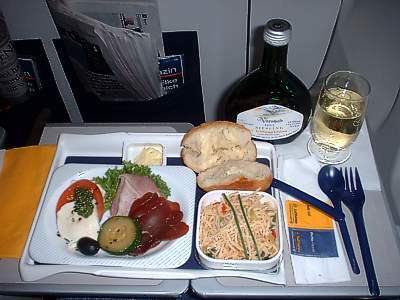 In First there is a large cardboard menu for each meal, with German on the first page, English on the second page, and the native language of the destination (where it isn't one of the former) on the following page. On the last page there is information about the chef who has designed - but not cooked - your meal. There is a separate menu with the wine list, marked Vinothek. This can run for several pages, and includes the delight of the "Monthly Proposal" with details on the wine or spirit of the month. 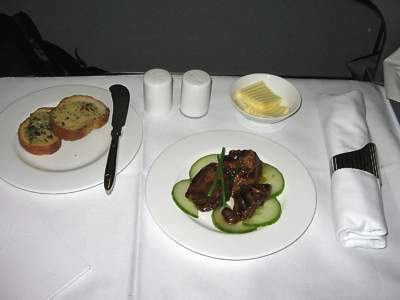 Meals are laid out on a decent white tablecloth, and you get all your courses brought to you individually. 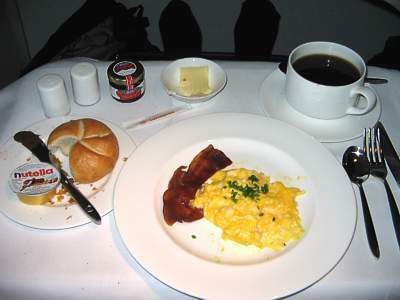 Note that even in First Class meals can be somewhat small (Minimalist is, of course, the Lufthansa way of describing it) because there is the assumption - certainly for overnight flights - that you'll eat in the First Class lounge on the way to the plane. 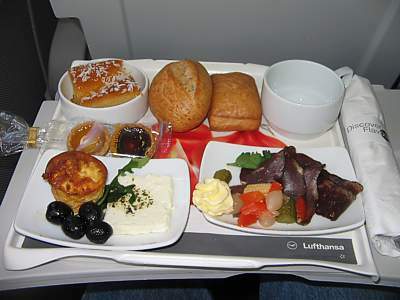 However Lufthansa crew are pretty good at getting you extra food if you feel peckish on the flight. Sweet and sour pork Shanghai-style. Not the best, but OK for a snack. 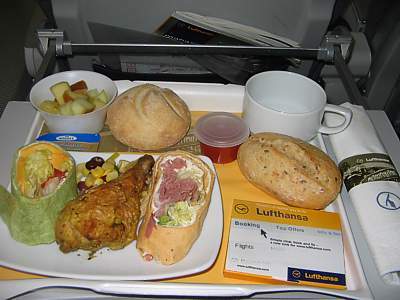 I do wish though Lufthansa would take a leaf out of Singapore or South African's First service, and come around with a tray of canapaes for you to select some before takeoff. Curly Endive, radicco, chicory and Lamb's lettuce with cucumber, peppers and Mushrooms. 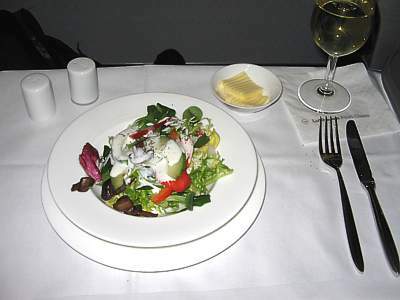 This is fantastic, one of the best salads I've had at 35,000 feet for a long time. All the ingredients are fresh, without the slightest hint of limpness or chill. Great dressing too. Roast Goose with red cabbage and melted potato dumplings. Lovely and tender, done just right, this shows what can be achieved in the air. Hot madeleine and Boerenjongens with rum in a jar served with Vanilla ice. This is a weird one. Tiny, but with lots of flavour. A plate with grapefuit, kiwi, orange, and redcurrants. A crossant and rollwith Nutella chocolate spread and strawberry jam. Lovely, but small and unexpected. There should be better options than this. Great to have the Nutella on board though. A piece of bacon. Scrambled eggs. A roll with Nutella chocolate spread and cherry jam. This miserable creation greets you if you're mad enough to go for the Cooked Breakfast on Lufthansa. 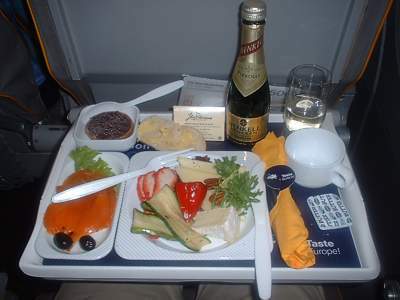 It's hard to know what's right about it - even economy get's better food than this. The bacon is char-grilled. The eggs look radioactive, and taste it too. This is to be avoided at all costs. In Business there is a decent looking menu, with the drinks list on the last page. 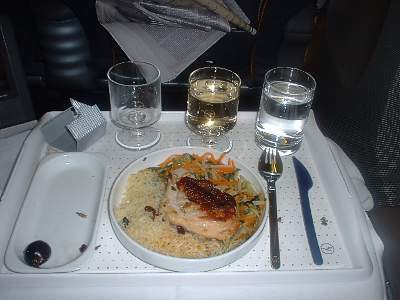 Meals are laid out on a decent white tablecloth long haul, on top of which is placed a tray. Smoked arctic venison enhanced by lentis and herbed cream cheese. Salad with Frisee, Raadicchio, lettuce and pumpkin with yoghurt herb dressing. A hot roll, with butter, and a tray with three cheeses (blue Castello, Allgau hard, and bell pepper) with three grapes. Ooo, this is a lovely started, just right to get the flight going, and worth the 2 hour wait for it. The venison has a very delicate flavour, while the salad is stunning. What you aren't told is that the cheese is there incase you go for the cheese option at the end of the dinner... you've got to keep it on the tray. Breast of corn fed chicken accented by Tarragon butter, vegetable Julienne, and Basmati rice with nuts. 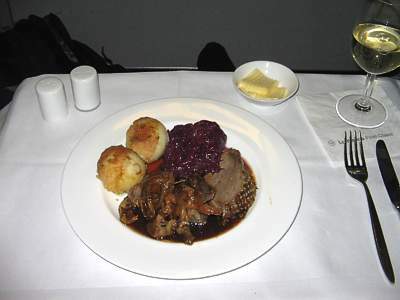 Oh dear, this is stunningly poor, and really lets down the whole Lufthansa performance. Hard boiled chicken, with rice glued to the bowl, and vegetables that had seen better weeks, let alone days. Poor service as well, with no more rolls offered. Altogether an experience I'd rather forget. Berry pudding with whipped cream. A Mozart Reber chocolate box, containing two mozzart chocolates. This is lovely, loads of flavour, and served with an extra chocolate as well. As the desert trolley comes round, baileys and port is offered. The chocolates make a good souvenir, as they are Lufthansa branded. A tray with three cheeses (blue Castello, Allgau hard, and bell pepper) with three grapes. Two biscuits, and a roll. Ah, now its clear why you need to keep the cheese. And very good cheese it is too. It's not really worth it though, as the biscuits are hard to come by. A cold plate featuring smoked beef and turkey breast, with Mondsee and cottage cheese, plus roasted grains. Quark creme with Kiwi gooseberry compote. Roll and Croissant with butter and strawberry jam. 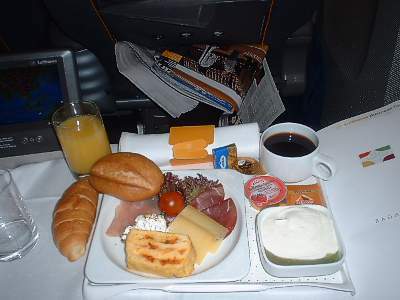 A very good breakfast, with plenty of flavour in the meat, although the roasted grains were too unusual for me. Good proper croissant which was light and delicate. Good kiwi compote as well - it seemed unusual to get a desert with breakfast, but it was served gone lunchtime local time, so I guess its understandable. In Business there is no menu, and no table cloth. You'll be lucky to be offered a choice. A bowl of fruit salad with apples, mellon, oranges and two grapes. A tub with a sliver of ham, cucumber and a tomato. A crossant, a roll, a tub of butter, a tub of Exquisa, a jar of hero strawberry jam. This is really very pleasant. 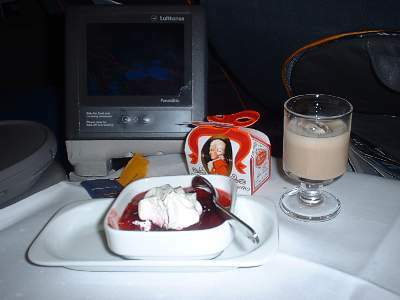 The fruit salad is just right, and the crossant soft & fluffy. A medalion of diced cod, with mozzerella, three tomatos, peas and bazil. A tub of spicy pesto sauce. A sliver of quiche. A roll. A pot of cream with fruit tartlet. A chocolate swizzle. Two mini fruit tarts. A tub of butter. Now this is weird. 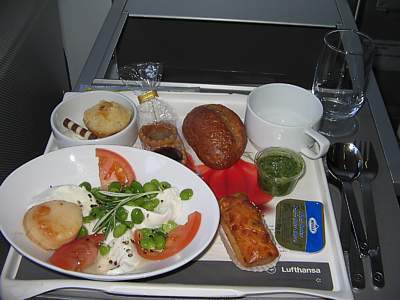 It seems as if the Lufthansa chefs just threw together everything they had left, and just made a mess on the plate. It's almost as if they just wanted you to have something to nibble on throughout the flight. You can put the cod together with pesto, and the quiche too, to make some sort of decent dinner. The cheese is very good. The desert it a bit odd - but nothing compared to the roll, which is baked hard. The two mini fruit tarts are in a decent pack to take off the plane. A large slab of feta cheese, brushed with pesto. A veggie quiche tartlet. Four olives. A sprig of rocket. A plate with slivers of dried beef, on mixed veg, with a knob of butter. A slab of coconut cake. Two rolls. Two mini fruit tarts. 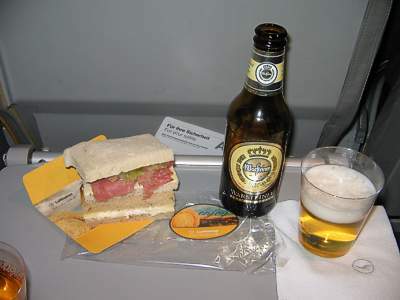 Goodness, the random mix of food on Lufthansa gets even weirder. This selection just doesn't work together at all. The only hope for this lot is to kind of pick at it and hope. The quiche is OK. Indeed, it goes OK with the veggies on the other plate. But then with the beef you can make a sandwich with one of the rolls, and use the feta in the other. 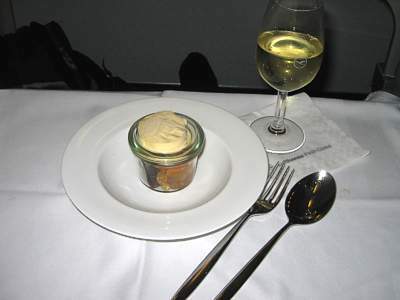 And then curse whoever thought of serving up this lot on a plane. A leg of chicken (cold) with a sliced wrap of cheese salad & a sliced wrap of ham in mayo. Sweetcorn. A tub of spicey sauce. A pot of fruit salad. Two hot rolls and butter. A big bar of chocolate. There's quite a lot here - however it feels anything but civilised eating the chicken leg with your fingers, and dunking it in the sauce which then dribbles all over the tray. The wraps are very good, although it's a bit odd that they are sliced. And the bar of chocolate is a very good idea - it's great to be able to take if off the plane. Two cold mini-burgers, and a small salmon steak. Diced cucumber & pepper salad on a bed of lettuce leaves with one slice of carrot & two onions. A dollop of mustard. A fruit flan. Hot roll and butter. This is certainly a weird combination - burgers and salmon is certainly unusual, and as for the rest of the stuff in the salad, well, it looks as if it was just thrown together at the end of the day. And yet, in context, it works. 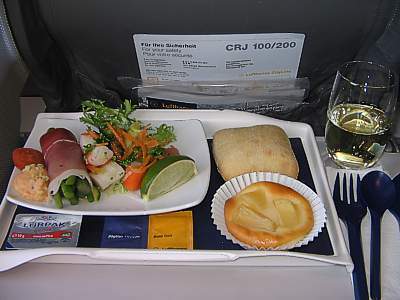 It really does, and makes a lovely light meal - not bad for a 45 minute flight. Even the mini fruit flan works well, with loads of flavour. Smoked salmon with two grapes. Plate of cheese with artichoke and strawberries. Blackcurrant tart. Hot roll and butter. Little quantity, but it makes up for it in flavour. A very good salmon, although I would have liked something to go with it. 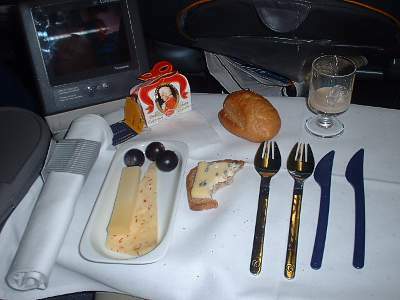 Plentiful cheese, and a good tart - not bad for a 45 minute flight. A roll of Palma ham around 5 sprigs of artichokes. A salad with a bed of rocket on which are onions and carrot. A tomato. A slice of lime. An apple tart. Hot roll and Lurpack butter. There are incredible flavours in this. 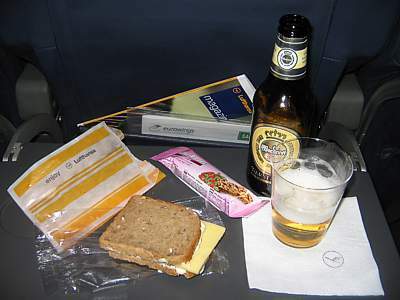 It is really quite incredible what Lufthansa can do for a short flight, and in the galley of a small CRJ. The lime seemed odd, but works really well with the Palma ham. A Santo Domino chocolate bar. A packet of Soletti Cheesy Sticks. 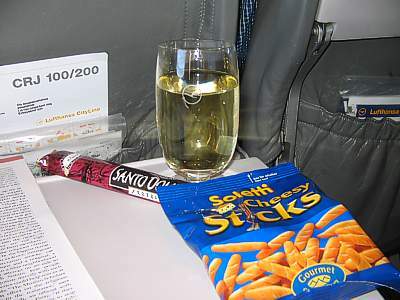 In Business class around Europe Lufthansa come around with a basket with chocolate bars and cheese snacks after the meal has been served. 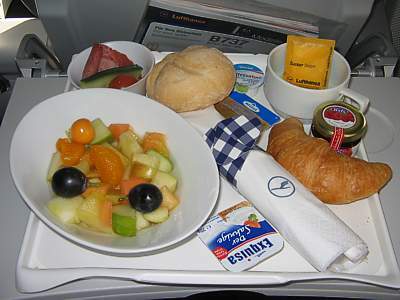 In Economy food is free on Lufthansa and Lufthansa Cityline, but comes in limited quantities. At breakfast and dinner times, you will be offered a choice of two medium sized rolls. At all other times, there is no choice, and a much smaller roll. A buttered wholemeal torpedo roll, with two slices of ham and one lettuce leaf. This is the standard breakfast and dinner offering - and while tasty, this is all that is on offer. A buttered dark bread torpedo roll, with one slices of turkey and two lettuce leafs. This is the alternative breakfast and dinner offering. When coming from German, darker bread is used. A wholemeal roll with seeds, with a slice of processed cheese and one lettuce leaf. This is the smaller version on offer during the day. There is little quantity, and little quality. True, on a 45 minute flight, you don't really need it, but something larger than this would be nice. A packet of two sandwiches. One with white bread and a slice of ham, with a sprinkling of celery. The other has brown bread, and soft cheese. A packet of two sandwiches. One with white bread and a slice of ham, with a sprinkling of onions. The other has brown bread, and a slice of edam with soft cheese on top. The marginally larger offering at lunchtime comes in it's own packet, and while small is ok.
A packet of two sandwiches. One with white bread and a slice of salmon, with a lettuce leaf. The other has brown bread, and a slice of edam with soft cheese on top. This is another variant of the snack on offer in the evenings. 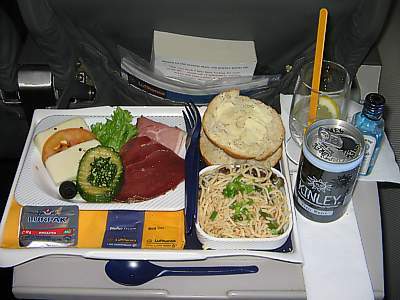 At least Lufthansa try to ring the changes, by adding in salmon as an alternative. This version of the cheese sandwich was much better. 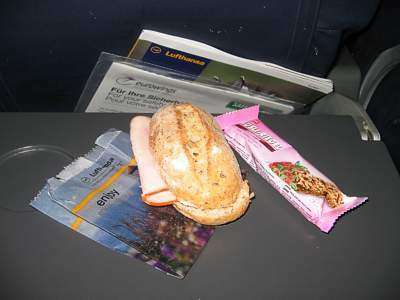 In Eurowings food is pretty much the same as on Lufthansa. A small dark with one slice of ham. Small, adequate - but really not that great. 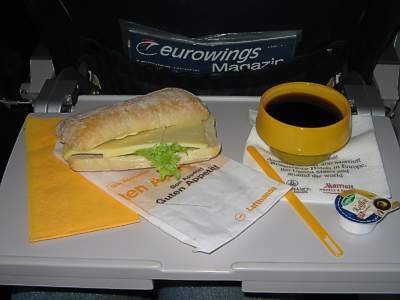 A small sandwich with dark German gread, and one slice of cheese. 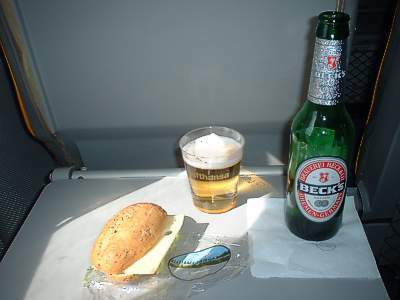 German and Swiss passengers may love this bread - but its a bit of an aquired taste. Its not great, but fills a hole. The chocolate bar is better. A large buttered roll, with two slices of cheese, and a lettuce leaf. 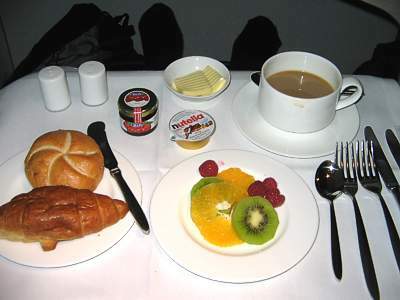 For breakfast time I was hoping that Eurowings would push the boat out a bit - but no. You get the same rolls as at dinner time. In this case, though, the roll is very good, and the cheese, although it looks processed, is very tasty. A dry white roll, with two slices of processed cheese and one lettuce leaf. 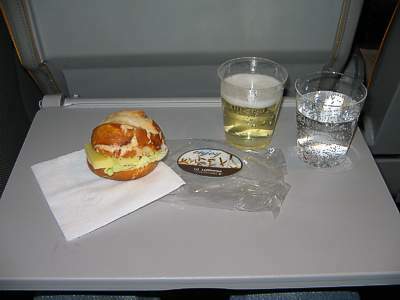 This is the smaller snack on offer during the day - even on somewhat longer flights. There is little quantity, although the quality is quite good. 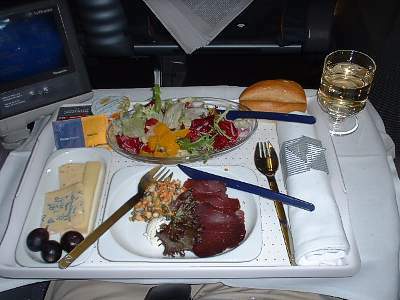 A cold platter with one slice of ham, one slice of beef, a tomato with cheese and herbs on top, a cucumber slice (one) an olive, and a sprig of parsley. A bowl of noodles, with smaller peppers and two slivers of spring onions. A hot roll, and butter. This is a bit of an odd combination, but the idea is that the ham and beef add to the noodles, making a normal dinner, and the tomato is a starter. 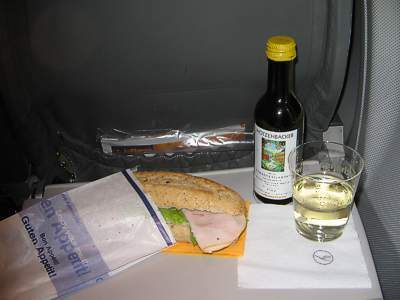 As always on Lufthansa, food comes in small quantities. 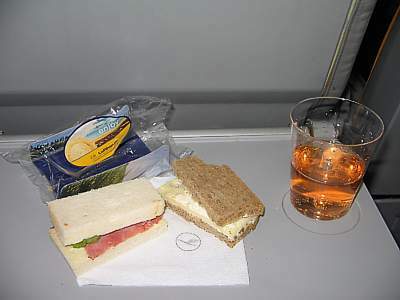 A cold platter with one slice of ham, two slices of beef, two slices of processed cheese, a tomato, a gerkin with cheese and herbs on top, an olive, and a sprig of lettuce. Another odd combination for Eurowings, but again in context, it does work. Really it does. The pepper and noodles are really hot - in taste - but deep frozen. A cold platter with four sections of turkey, two types of cheese, a pepper and four olives. A bowl of miniture pasta, with smaller peppers and one lettuce leaf. A hot roll, and butter. Another strange combination, but in context it works. It really does. 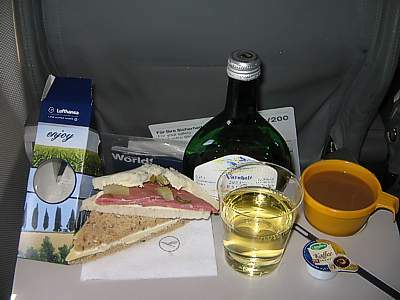 This is one of the best Lufthansa lunches I've had short-haul. The pasta is done just right, and although cold has lots of flavour. Good cheese too - although I was at a bit of a loss as to what to do with it, and ended up using it in the roll.